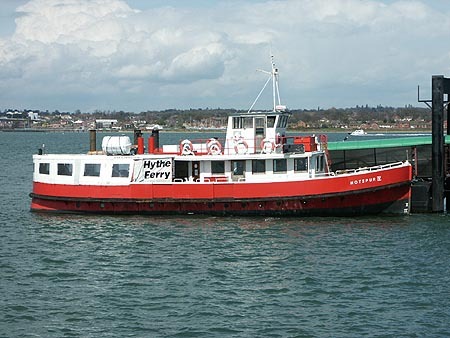 Maps dating back to 1575 have shown the existence a Hythe ferry, although the local boatmen would have been carrying passengers and goods to and from Southampton for many years before this. 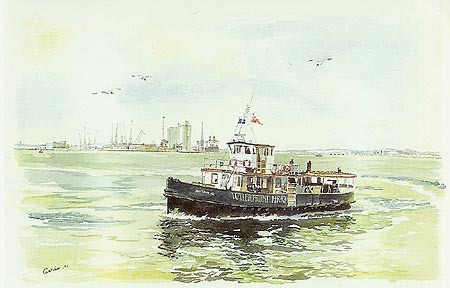 Steamer services from Southampton to the Isle of Wight began in 1820, and the wooden steamship Emerald began a service to Hythe in 1830, also serving Cowes. 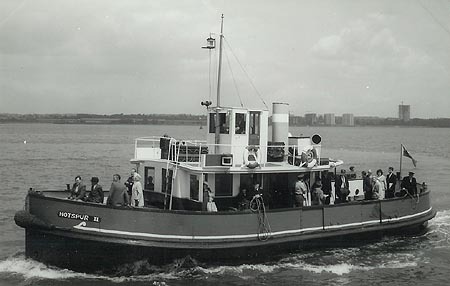 Emerald was the first excursion steamer at Southampton, running one hour trips on occasion, and also the first advertised tug available for towing. 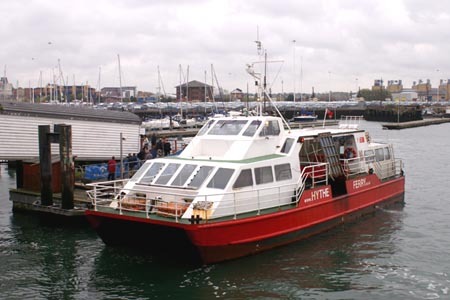 The profit from the Cowes run and these other activities resulted in the withdrawal of the Hythe service in 1832. 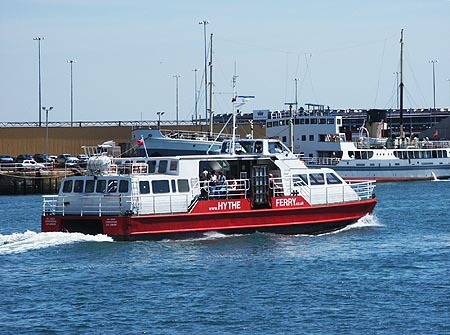 Services restarted with the iron Forester in 1835. Other ships followed, including Gipsy, Prince Alfred, Lady Elizabeth, Louisa and Frederica, the latter pair being owned by Frederick Fry. Few profits were made, partly due to problems with tides, services at this time running from the Hard. The solution was to build a pier. 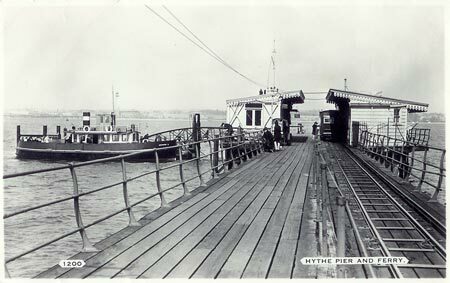 Initial plans for a 2000 foot pier at Hythe were lodged in 1870, but Parliamentary permission was not granted until 1878. 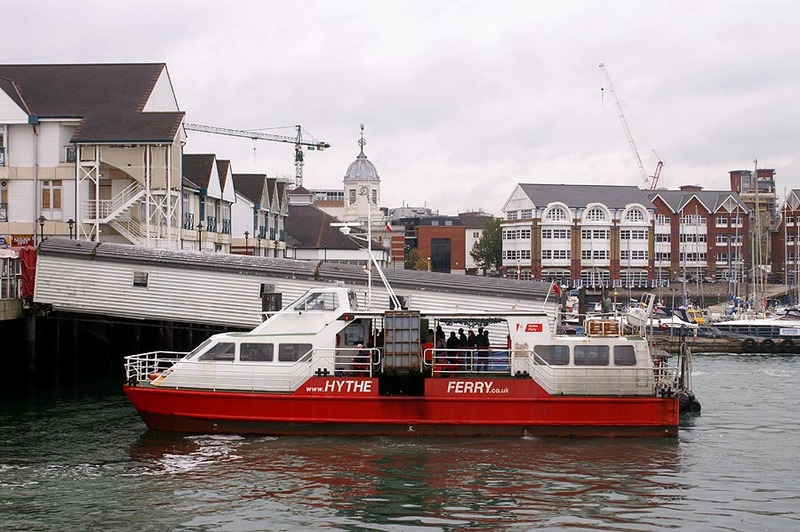 The company had the lengthy title of Hythe Pier and Hythe and Southampton Ferry Company Ltd, not becoming the Hythe Pier Company until 1923. 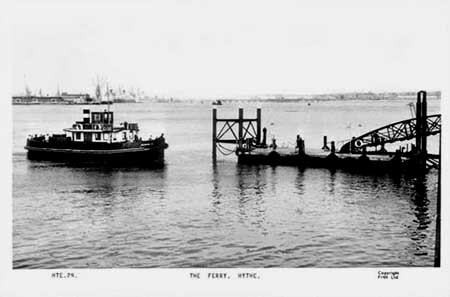 Construction began in 1879, and the pier was opened in 1881. 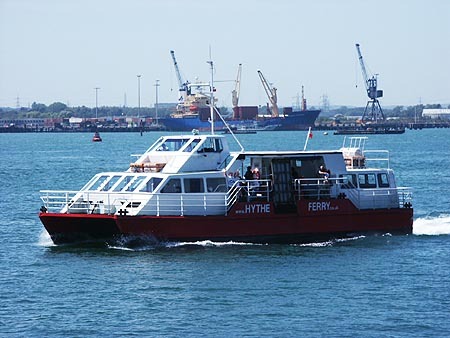 Ferries used after the opening of the pier included the Louisa and Frederica, previously owned by Frederick Fry. 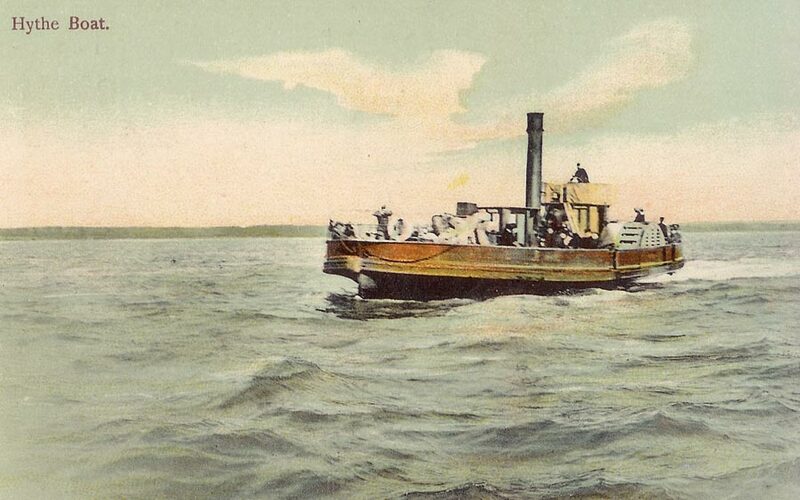 The first Hotspur was built in 1889, an 80 ft paddle steamer with a single cylinder oscillating engine. She was followed by the similar Hampton in 1894, which had a two cylinder compound engine. Both ships could carry around 200 passengers. 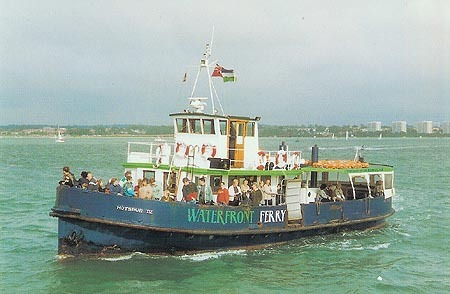 Ferry services were later run by the General Estates Company, formed in 1900. This was owned by the Percy family, a famous member of which, immortalised by Shakespeare, had been known as 'Harry Hotspur'. The use of this name in 1889 indicated early involvement of the Percy family. 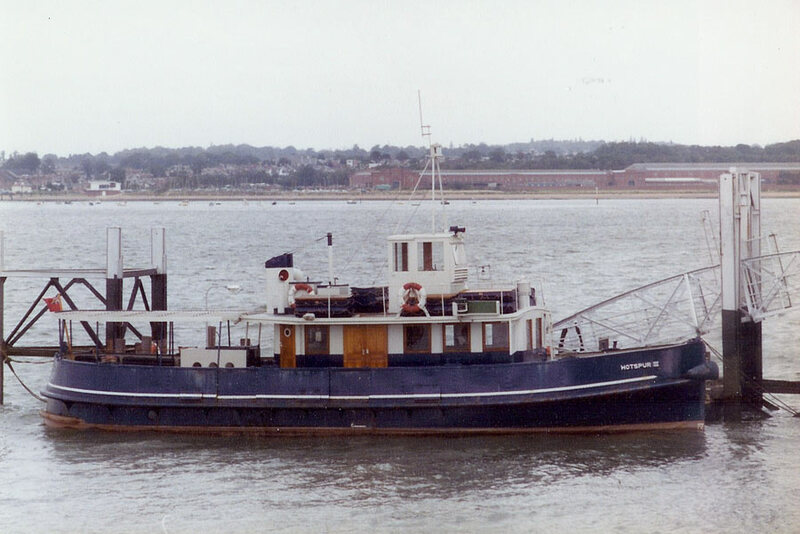 Hotspur (1) and Hampton were joined by the 40 ft motor launch Hamble, carrying 60 passengers, in 1915. 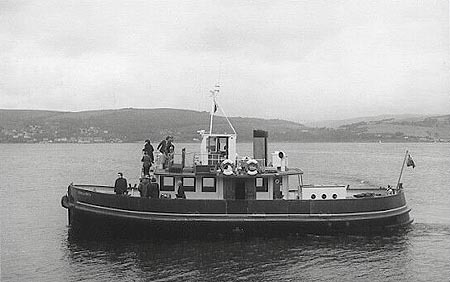 The second Hotspur, a twin screw 80 ft motor vessel, in 1927, and she was certified for 300 passengers. 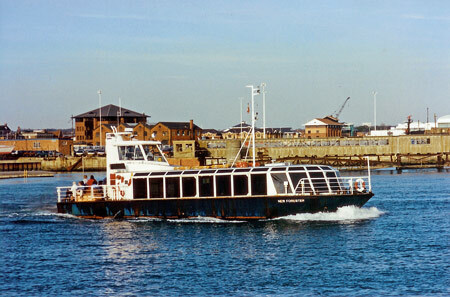 Hotspur (2) was built by Samuel White at Cowes. The original machinery installation was not successful, and was replaced with a steam engine in 1932. Hotspur (2) survived with the company until 1947, when the Hotspur IV was delivered. 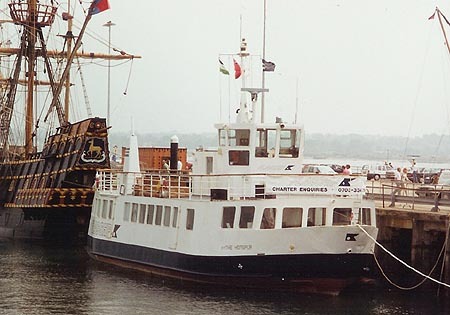 She was then used as an excursion steamer at Yarmouth until 1961, after which she was used as a moored club in London as the Yard Arm Club, Emma Hamilton and Hispaniola, being removed in the mid-1970s. 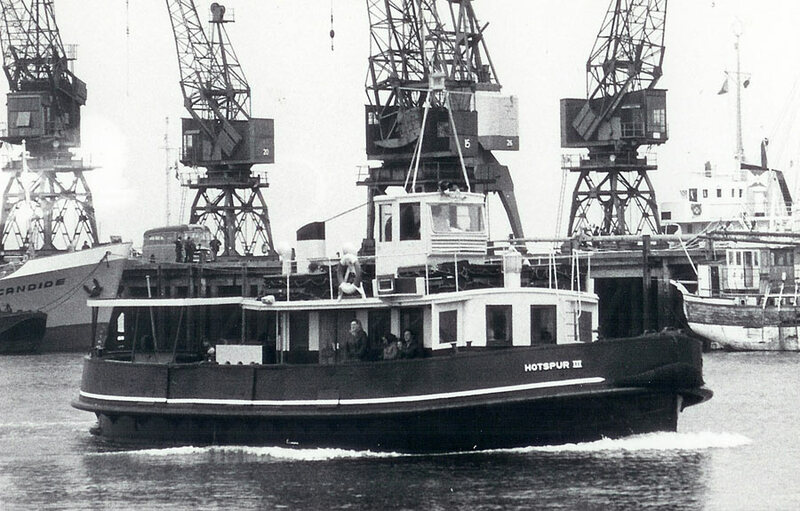 Hotspur II followed in 1932, built by the Rowhedge Ironworks. 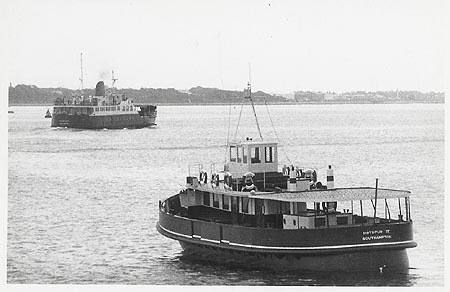 She was 56 ft long, carrying 300 passengers, and ran until 1978, when she was sold to Clyde owners as the Kenilworth. Hotspur III was similar to Hotspur II, again a product of the Rowhedge Ironworks. 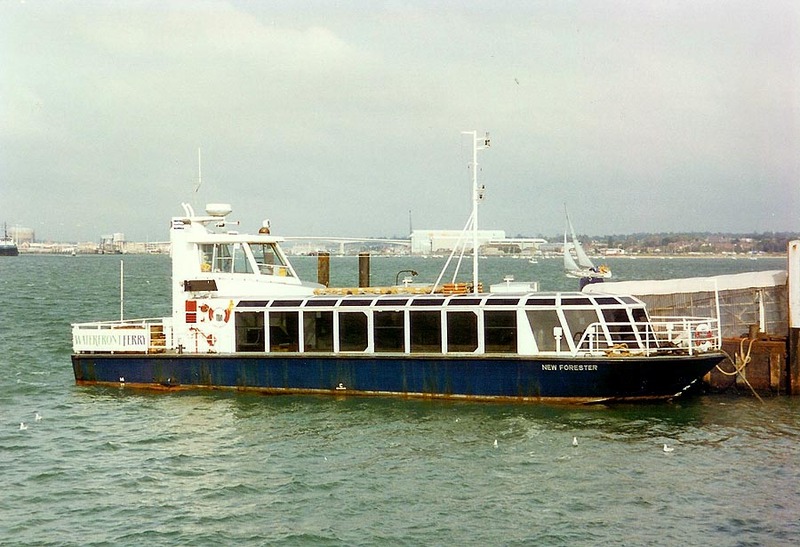 They also built the Hotspur IV in 1946, which was larger at 64 ft long and 350 passengers (now 300). Hotspur II and Hotspur III were re-engined with Gardner diesels, similar to those in Hotspur IV, in 1949. 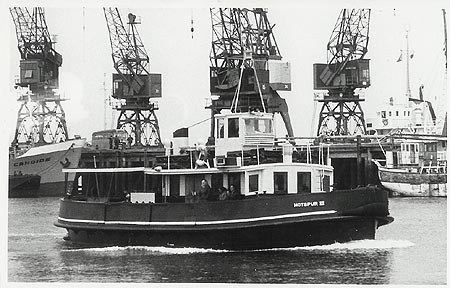 All three ships were re-engined again between 1968 and 1971 with more powerful Kelvin diesels, increasing the speed of Hotspur IV from 8.5 to 9.5 knots. 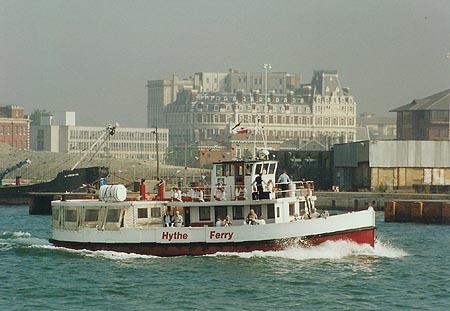 The Southsea Queen from the Portsmouth Harbour Ferry Company was bought in 1978 and renamed Hythe Hotspur. She was used mainly on excursions, but could act as relief ferry. 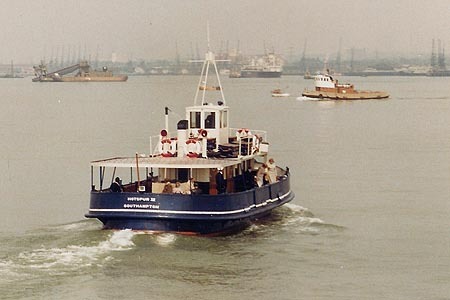 Hotspur III was broken up in 1981. The waterbus style New Forester was delivered in August 1982. 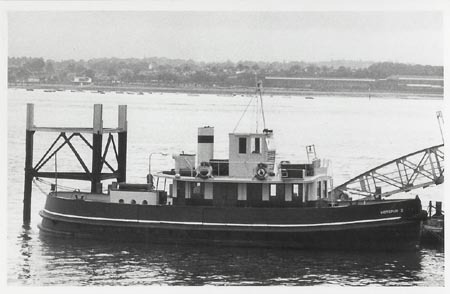 She used the 1971 Kelvin diesels from Hotspur III. 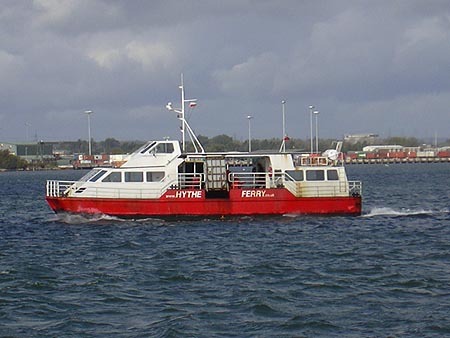 Ownership of the ferries, previously General Estates, changed a number of times from 1980, first to Southern Coastcraft, then Waterfront Ferry, and finally White Horse Ferries. 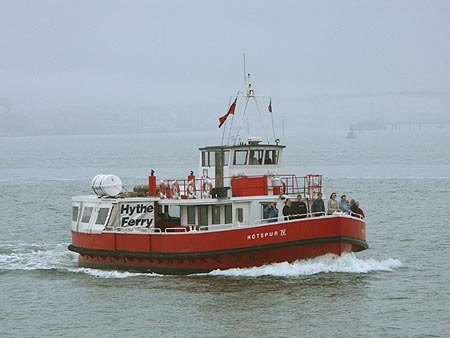 Hythe Hotspur was sold in 1995, passing to Harveys of Poole, followed by New Forester in 1999, which went to the River Dart. 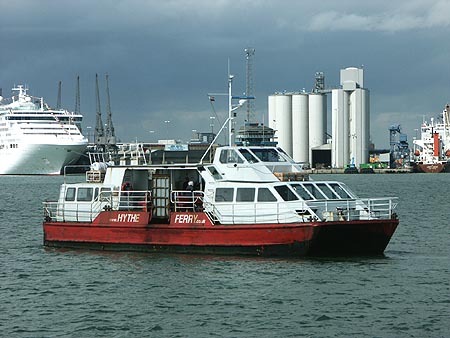 White Horse Ferries moved their Great Expectations from their Tilbury-Gravesend service to join the Hotspur IV. In 2006, the Town Quay terminal moved temporarily to the Red Funnel fast ferry berth, since the previous berth needed work (under way in 2007). Great Expectations and Hotspur IV maintain services in 2007. 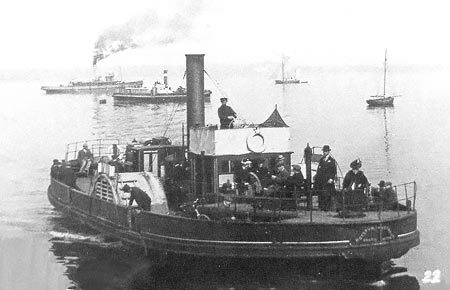 The first Hotspur (1) was built in 1889, an 80 ft paddle steamer with a single cylinder oscillating engine. 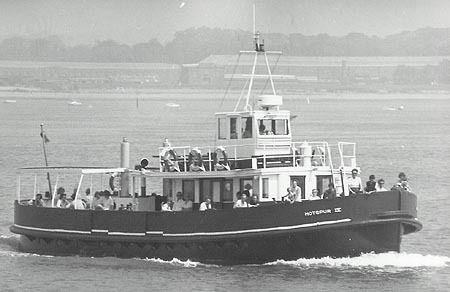 She was built at Plymouth for James Percy - the Percy family who later owned the General Estates Company. Hotspur (1) was 80 ft long and 62 gross tons. She was renamed G.E.C. in 1927, releasing the name for Hotspur (2). G.E.C. was soon sold. Her engines were removed and the hull left to rust away. 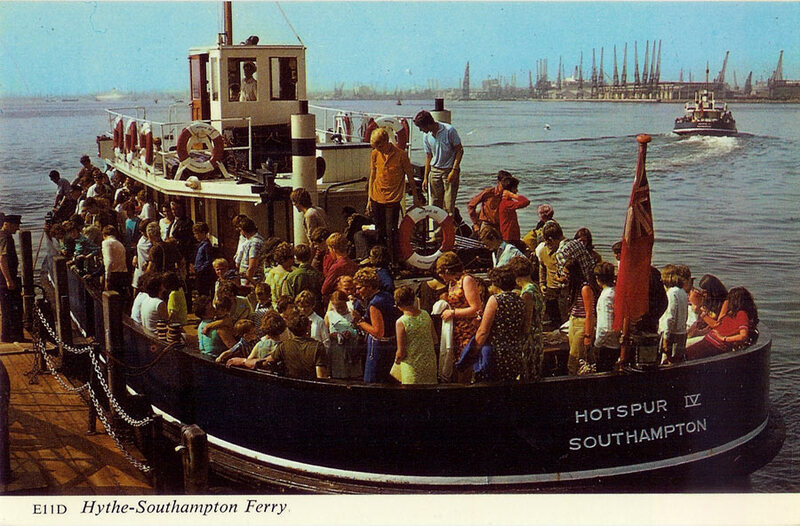 London View Company postcard of Hotspur (1). 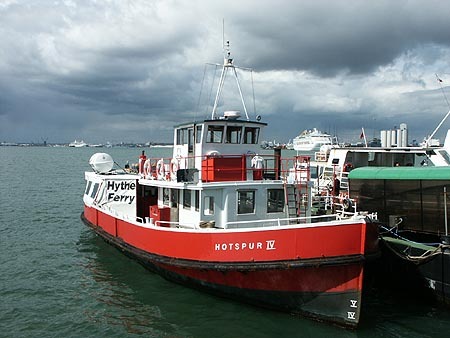 The first Hotspur was built in 1889, an 80 ft paddle steamer with a single cylinder oscillating engine. 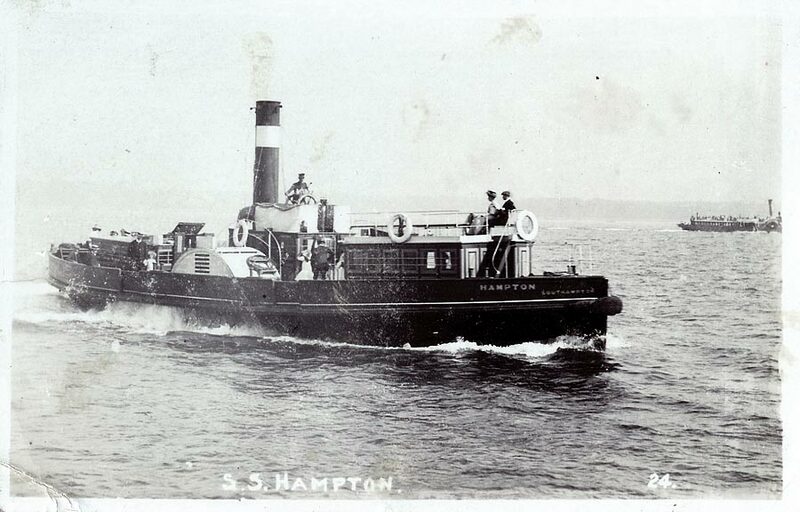 She was followed by the similar Hampton in 1894, which had a two cylinder compound engine. 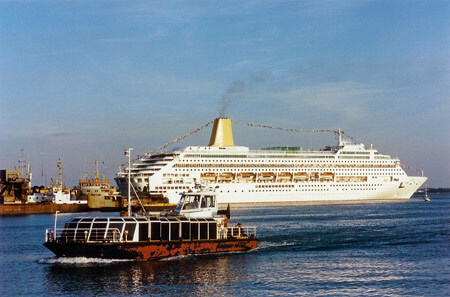 Both ships could carry around 200 passengers. 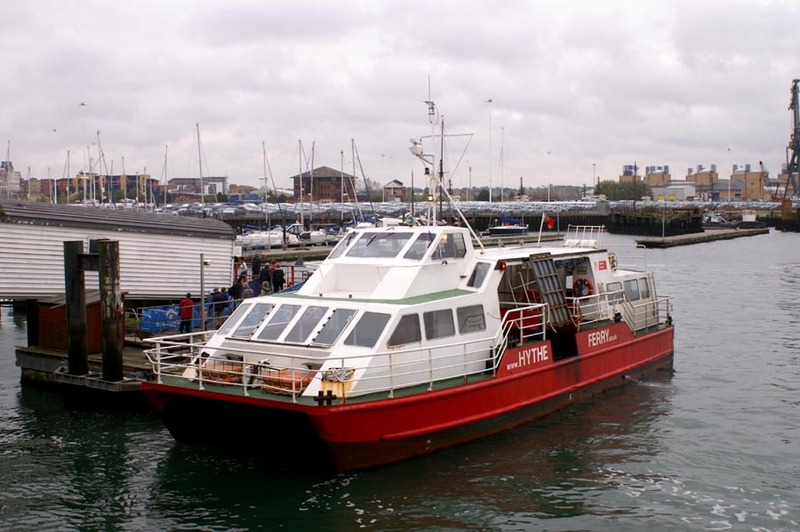 They were joined by the 40 ft motor launch Hamble, carrying 60 passengers, in 1915. 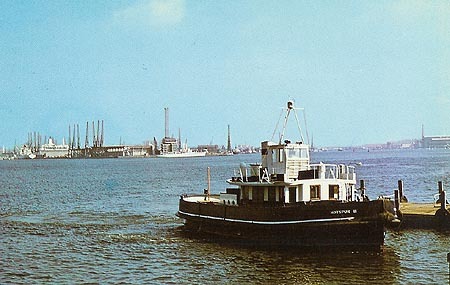 Hampton was sold to Dutch shipbreakers in 1936. Postcard of Hampton at Hythe Quay. 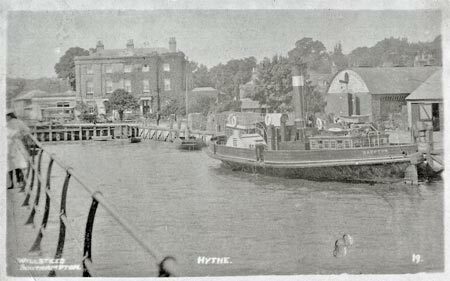 F.Copeland postcard of Hampton at Hythe Quay, posted 15th July 1920. 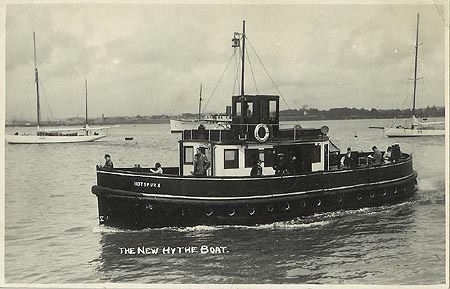 Hotspur (1) and Hampton were joined by the 40 ft motor launch Hamble, carrying 60 passengers, in 1915. 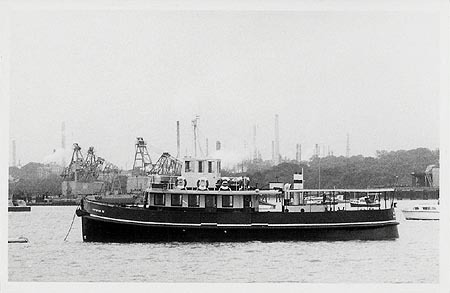 The second Hotspur, a twin screw 80 ft motor vessel, in 1927, and she was certified for 300 passengers. 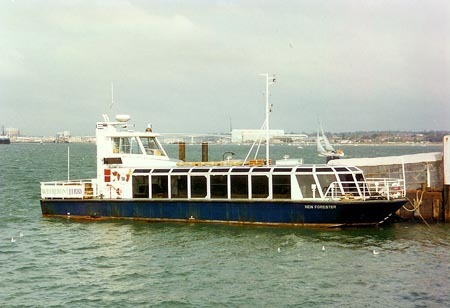 Hotspur (2) was built by Samuel White at Cowes. The original machinery installation was not successful, and was replaced with a steam engine in 1932. Hotspur (2) survived with the company until 1947, replaced by the Hotspur IV. 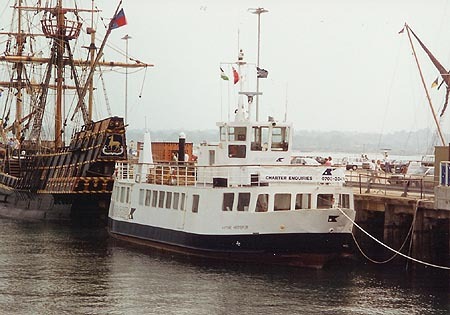 She was transferred to associated company the Yarmouth & Gorleston Steamboat Company who retained her until 1961, after which she was used as a moored club in London as the Yard Arm Club, Emma Hamilton and Hispaniola, being removed in the mid-1970s. Postcard of Hotspur (2) arriving at Hythe. 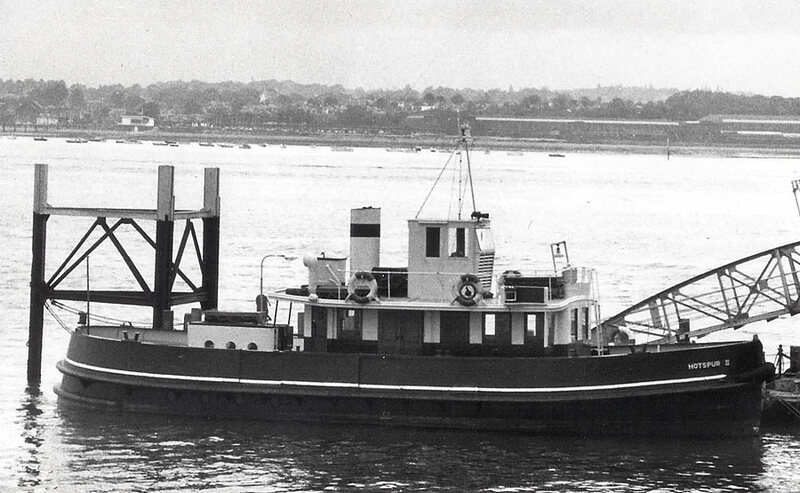 Hotspur II was built in 1932 by the Rowhedge Ironworks in Essex. 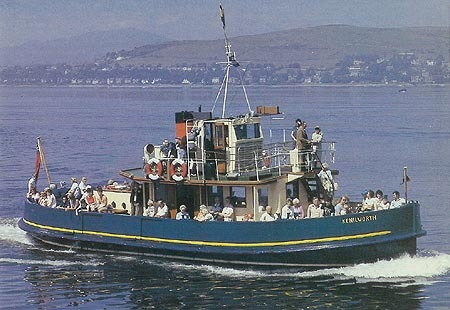 She was 56 ft long, carrying 300 passengers, and ran until 1978, when she was sold to Clyde owners as the Kenilworth. Hotspur III was similar to Hotspur II, again a product of the Rowhedge Ironworks. 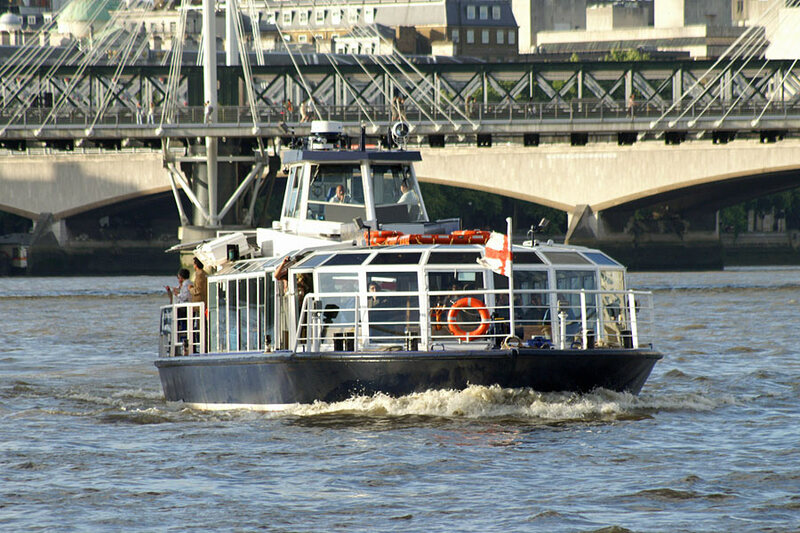 They also built the Hotspur IV in 1946, which was larger at 64 ft long and 350 passengers (now 300). Hotspur II and Hotspur III were re-engined with Gardner diesels, similar to those in Hotspur IV, in 1949. 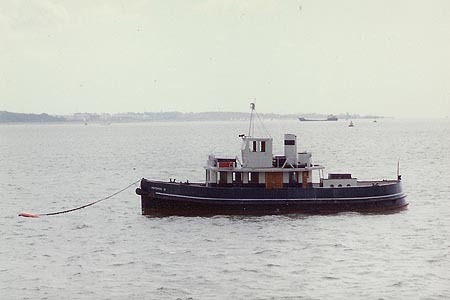 All three ships were re-engined again between 1968 and 1971 with more powerful Kelvin diesels, increasing the speed of Hotspur IV from 8.5 to 9.5 knots. Postcard of Hotspur II when new with no funnel. Dearden & Wade postcard 1200 of Hotspur II at Hythe Pier. 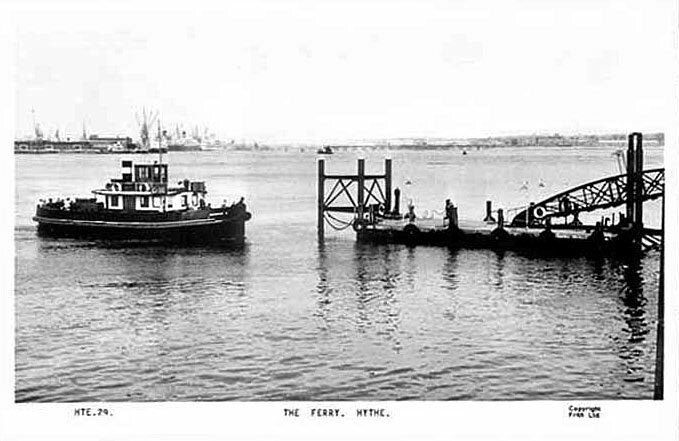 Forest postcard 1233 of Hotspur II at Hythe Pier. Frith postcard HTE.24 of Hotspur II at Hythe Pier. 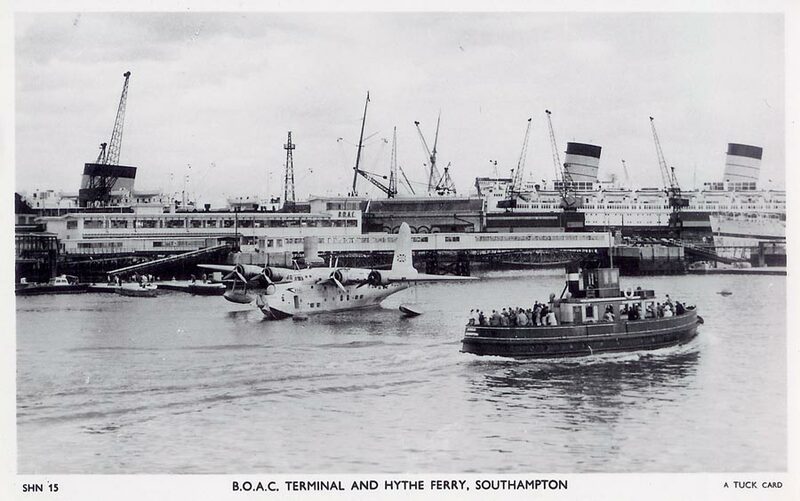 Fantastic Tuck postcard SHN15 of Hotspur II at Southampton with Queen Elizabeth and BOAC flying boat. Postcard of Hotspur II at Hythe Pier. 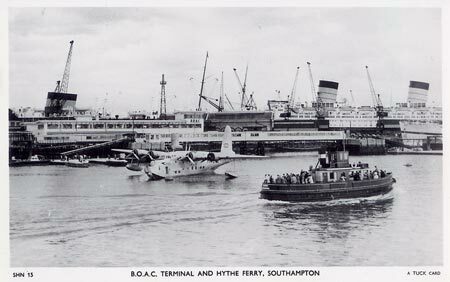 Southampton docks with the QE2 in the background. Duncan photographic postcard of Hotspur II. 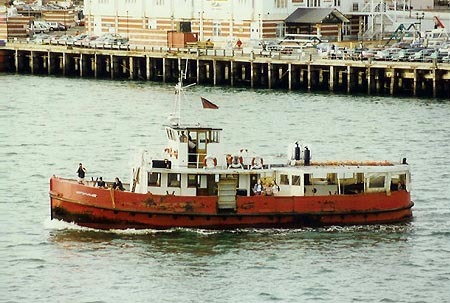 Hotspur II at Hythe Pier. 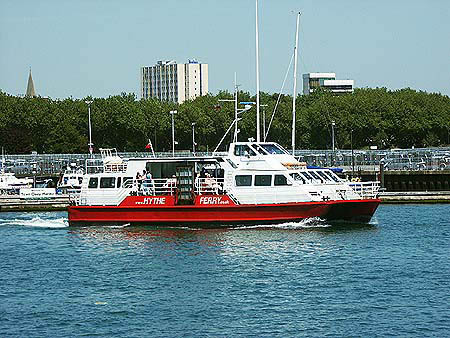 Hotspur II moored off Hythe Pier. 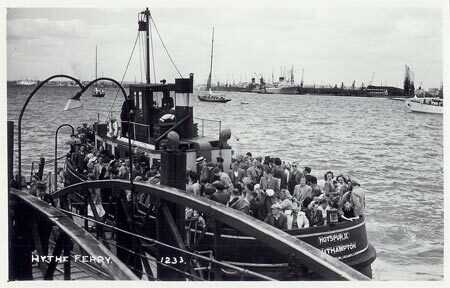 Hotspur II arriving at Hythe Pier. 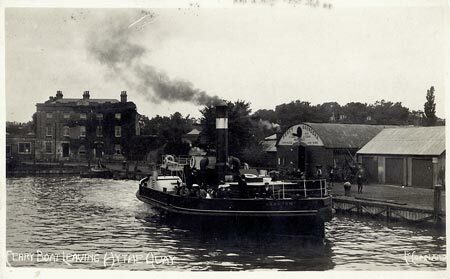 Duncan photographic card of Kenilworth on the Clyde. Colourmaster postcard R80633 of Kenilworth on the Clyde. Hotspur III was similar to Hotspur II, again a product of the Rowhedge Ironworks. 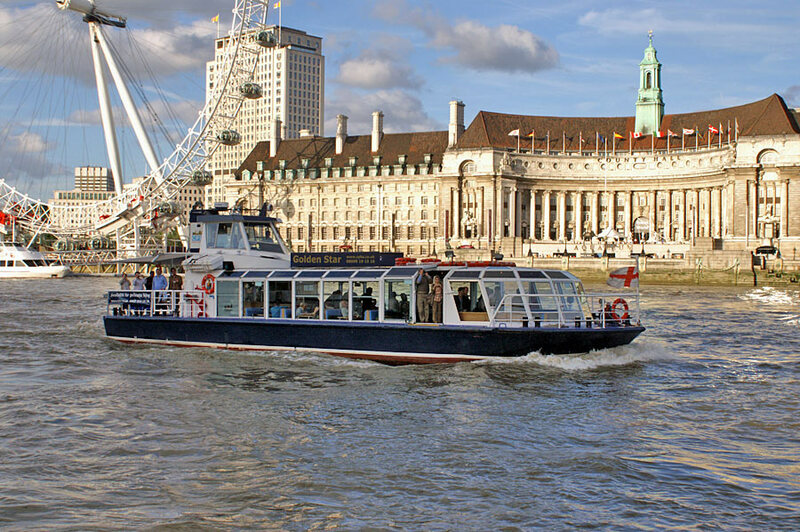 They also built the Hotspur IV in 1946, which was larger at 64 ft long and 350 passengers (now 300). Hotspur II and Hotspur III were re-engined with Gardner diesels, similar to those in Hotspur IV, in 1949. 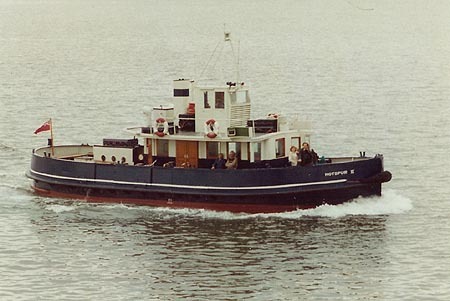 All three ships were re-engined again between 1968 and 1971 with more powerful Kelvin diesels, increasing the speed of Hotspur IV from 8.5 to 9.5 knots. 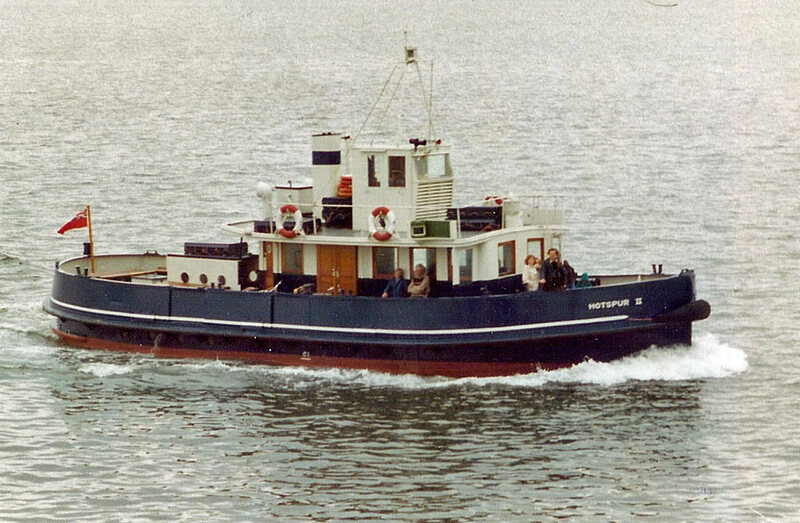 Hotspur III was broken up in 1981, after a corr0ded keel plate was discovered and considered beyond economic repair. 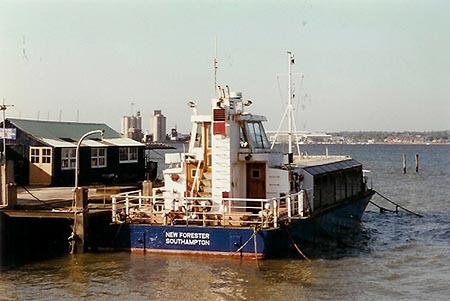 The waterbus style New Forester was delivered in August 1982. 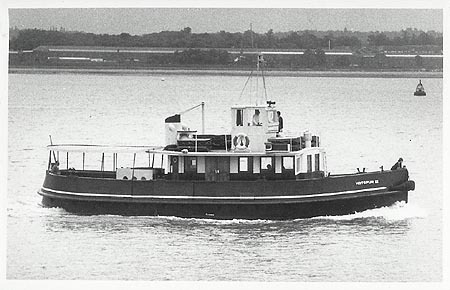 She used the 1971 Kelvin diesels from Hotspur III. 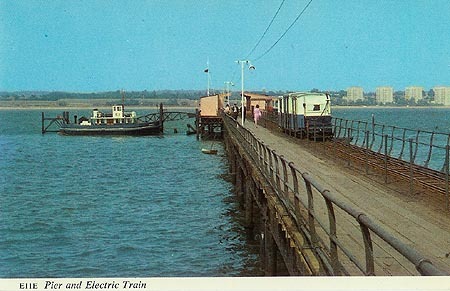 Harvey Barton postcard E11E of Hotspur III at Hythe Pier. 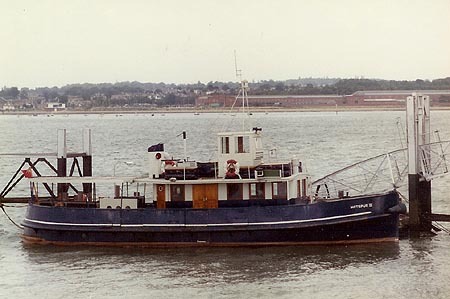 Hotspur III at Hythe Pier. 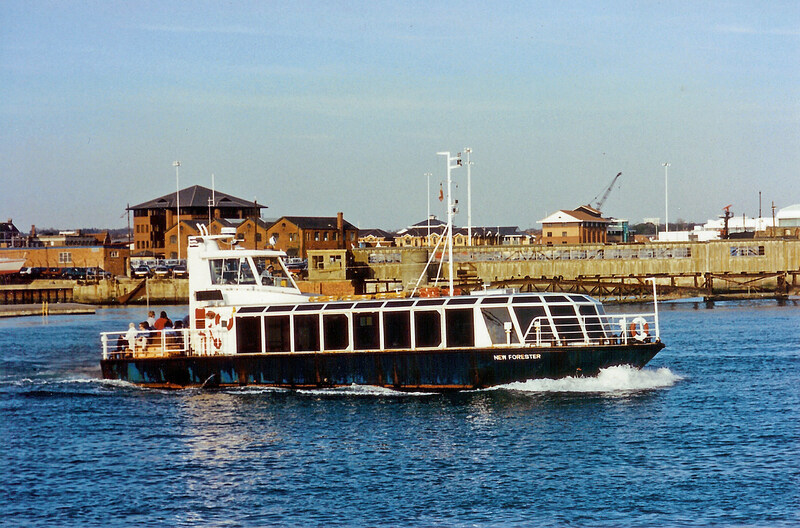 Hotspur III heading towards Southampton. Hotspur III heading towards Hythe. 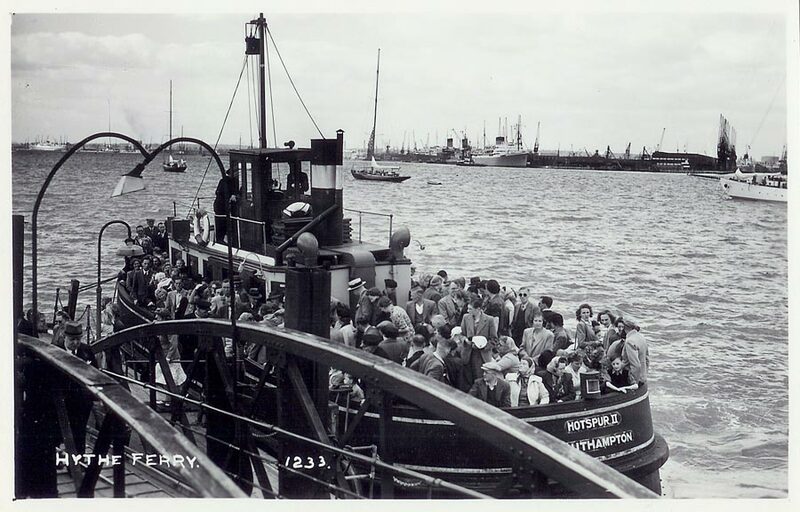 Harvey Barton postcard E11D of a busy Hotspur IV at Hythe Pier - Hotspur II leaving for Southampton. 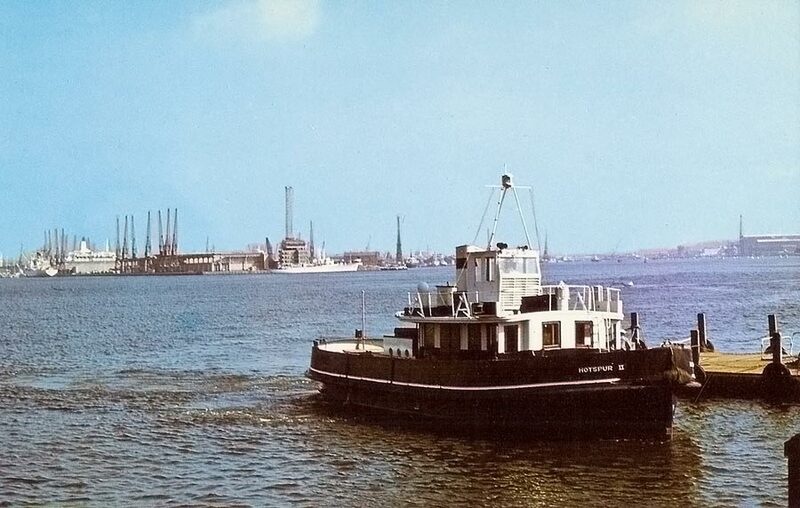 Duncan photographic postcard of Hotspur IV. 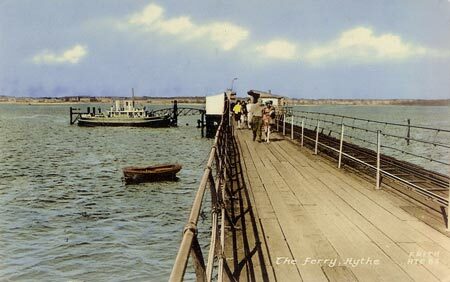 Hotspur IV moored off Hythe Pier. Simplon Postcards release sp1132 of Hotspur IV in Waterfront Ferry colours. 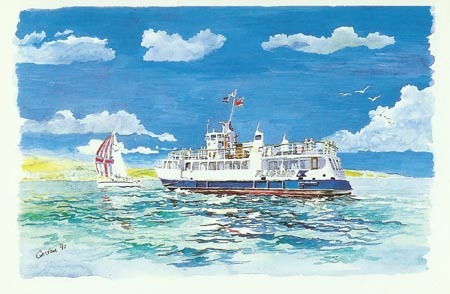 Art postcard of Hotspur IV in Waterfront Ferry colours. 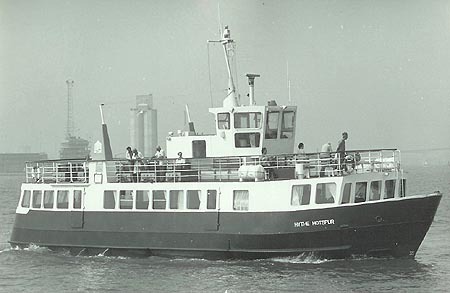 Hotspur IV in White Horse Ferries colours. Photo: &COPY; Ian Boyle, 14th April 2005. Photo: &COPY; Ian Boyle, 30th April 2005. Hotspur IV at Hythe Pier, which is looking increasingly shabby. Duncan photographic card of Hythe Hotspur. 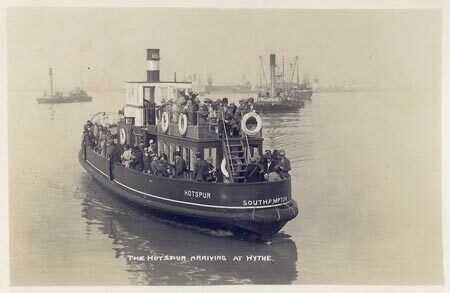 Art postcard of Hythe Hotspur with Flagship logo. 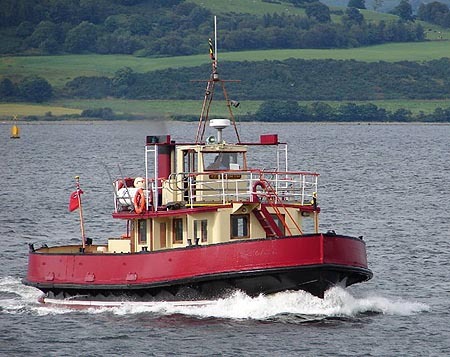 She was used mainly for charters. Hythe Hotspur at Southampton with Golden Hinde replica. 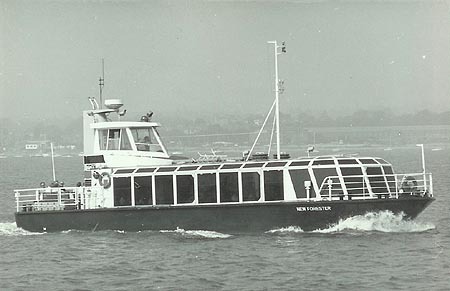 The waterbus style New Forester was delivered in August 1982. 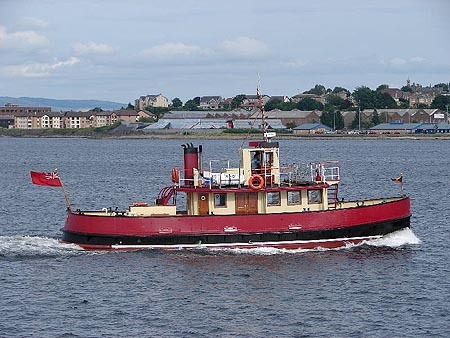 She used the 1971 Kelvin diesels from Hotspur III. 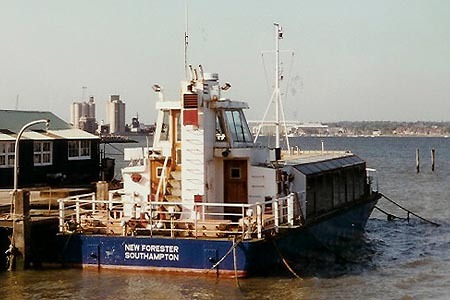 New Forester was sold in 1999, and went to operate on the River Dart. 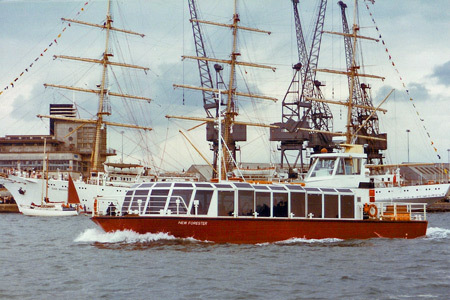 She was owned by River Dart Cruises, based at Baltic Wharf, Totnes, renamed Baltic Star, and was fitted out for charters. 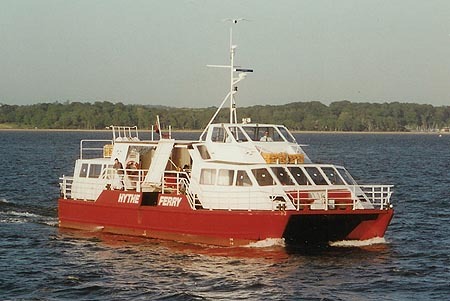 In 2002, she was taken over by Dart Pleasure Craft, and repainted in their colours with a blue hull and based at Dartmouth, but still used for charters. 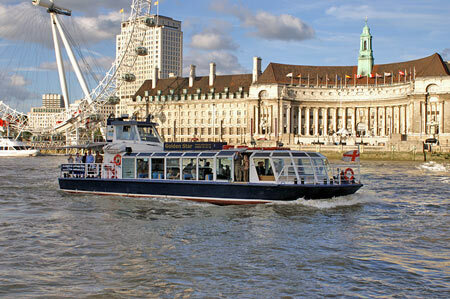 In January 2006 she was bought by Capital Pleasure Boats for use on charters on the River Thames in London. 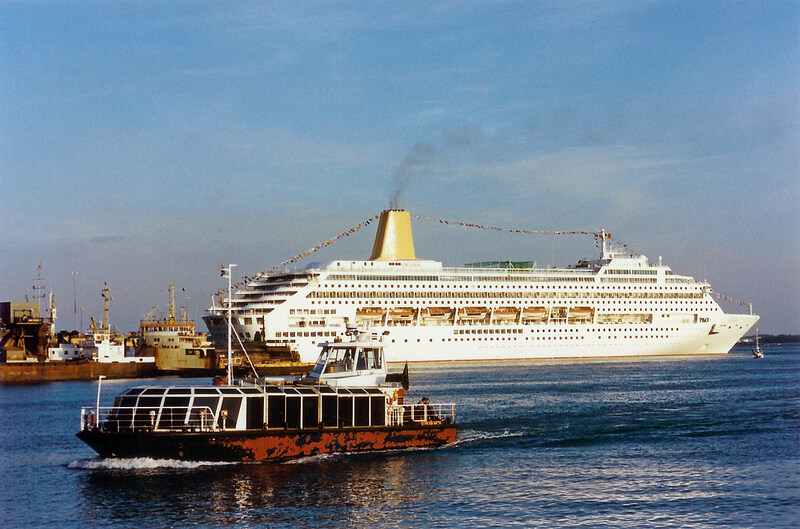 She was renamed Golden Star. Duncan photographic card of New Forester. Blue paint worn off to show previous red. Oriana had her naming ceremony on this day. 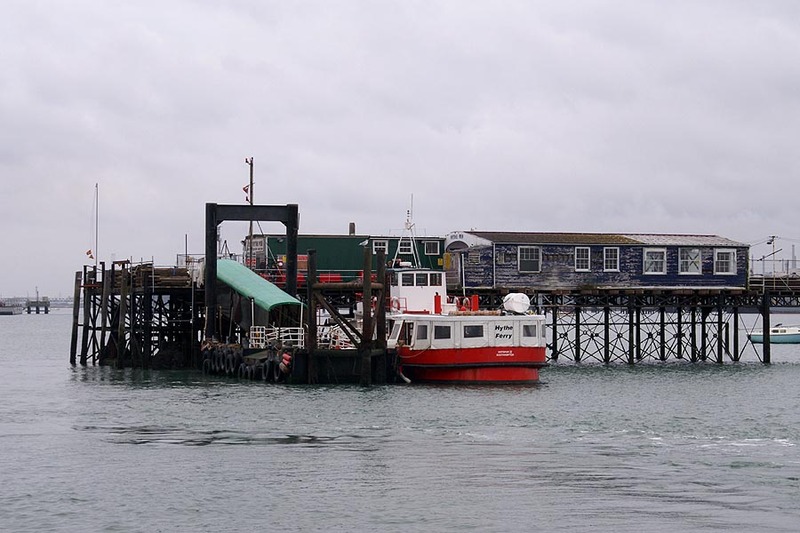 Photo: &COPY; Ian Boyle, approaching Hythe. Photo: &COPY; Ian Boyle, 12th July 2003.